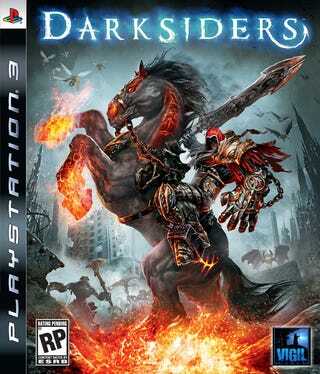 I first saw Darksiders a year ago in the events leading up to E3 2008. At the time the game didn't impress me. Darksiders: Wrath of War seemed an amalgam of action titles painted with such broad strokes that it rendered the game undeniably generic. But what I saw this year of the game, renamed to just Darksiders, had enough polish, enough tweaks to help better define it as it's own game and make me want to play through it. A third-person action game developed by Vigil Games and inspired by the apocalypse, not the Schwarzenegger sort of apocalypse, but the bible sort. You play as War, one of the four horsemen of the apocalypse, trying to find out how the end times rolled out early and caught in the middle of the battle between heaven and hell taking place a hundred years after things turned ugly. I played for about 15 minutes in a section well into the game. The game is due out this fall for the Playstation 3 and Xbox 360. Identity Crisis: From what I saw of Darksiders, the game isn't quite as role-playing heavy as the developers would lead us to believe. They call it a Zelda for adults, but what I've seen of it so far makes me think it's more an action game with some leveling up. The developers either need to start showing off the RPG element or get comfortable with the notion that they have a solid action game on their hands. Roaming: Open worlds are great and all, but not when you're left wondering what you need to do next to move the plot forward. I eventually figured it out, but not before roaming around a collapsing city of dead ends. Wrath's Hair: Seriously, that's Wrath's haircut. No wonder he's so angry. Couldn't he at least tuck it into his hood? Puzzling Bosses: When you're playing a game so reliant on button-mashing and combos it's nice to be occasionally confronted with an opposing enemy that requires a bit of thought to be taken down. And every boss fight, I'm told, will have some puzzle elements. Role-Playing Elements: They're slight, but I do like what RPG elements I did see in the game like leveling up, a bit of exploration and the spell casting of sorts. Aesthetic: The first time I saw Darksiders it did little, visually, to set itself apart. It seems the game has been tweaked, the visuals molded, to give the game a much more distinct look this time around. Now the game feels more like it's own game and less like God of War set in the apocalypse. Stunning Sets: One of the things that Darksiders has going for it is the biblical, end-of-world backdrop for the game, and the developers seem to be taking full advantage of that. The level I played in was set in a decimated city, one filled with roaming souls and demons. More interesting, though arethe ways in which creatures are built into the fabric of the game. It's amazing to see a gateway unfold itself and rise up from a building to become a stone golem. Hopefully, the game has more of these moments and creatures. Darksiders has come a long way since it was first announced, fortunately all for the better. The game's development has aged well, moving toward something a bit more unique, a bit more subtle than a clone of God of War. It is most certainly it's own game now, but with a new God of War looming and the likes of Bayonetta and Dante's Inferno coming, the field has suddenly gotten very crowded.